Gravitational waves 'seen' from black holes Jump to media player Scientists are closer than ever before to finding out how the Universe began. 'Sound' of the gravitational wave Jump to media player The BBC’s Pallab Ghosh explains the sound of the first gravitational wave to be detected. 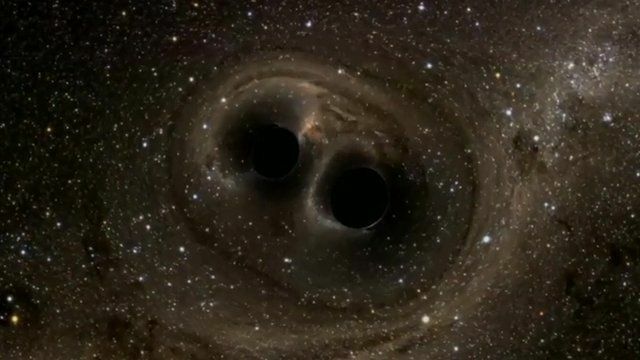 Five reasons gravitational waves matter Jump to media player The BBC’s Pallab Ghosh explains why the detection of gravitational waves is so important. 'We have detected gravitational waves' Jump to media player Professor David Reitze says the discovery of gravitational waves "opens a new window onto astronomy". Hawking hails gravitational wave find Jump to media player Acclaimed physicist Professor Stephen Hawking says the first observation of gravitational waves is "groundbreaking". On the trail of Einstein's last mystery Jump to media player It is 100 years since Albert Einstein predicted them but where are the Universe's gravitational waves? What is Einstein's Theory of Relativity? Jump to media player Everything you need to know about Einstein's 100-year-old Theory of General Relativity. Scientists are closer than ever before to finding how the Universe began. They have proved the existence of so-called gravitational waves - that's what Einstein called them 100 years ago. Science correspondent Pallab Ghosh reports on what is being described as a landmark in scientific endeavour.